After Braxton Bragg defeated Rosecrans at Chickamauga in September 1863, the Confederates besieged the Union army at Chattanooga. Ambrose Burnside and his Union IX Corps had advanced on Knoxville, Tennessee, and Gen. Longstreet's corps was detached from Bragg's army to retake the city. Confederate troops under W.E. "Grumble" Jones moved from Southwest Virginia into Tennessee to assist Longstreet. This movement of Confederate troops from Southwest Virginia increased the importance and the vulnerability of the Virginia and Tennessee railroad bridge over the New River. 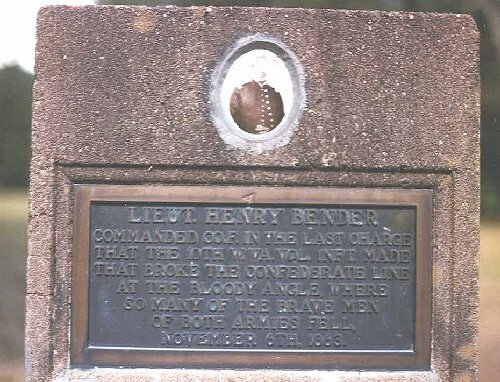 On November 1st, Gen. Averell moved south from Beverly, West Virginia toward Lewisburg. Starting on November 3rd, Gen. Duffie moved east from Charleston to meet up with Averell at Lewisburg. After "liberating" all of West Virginia, the Yankees would move into Southwest Virginia and destroy the vital bridge over the New River. As Averell moved on Lewisburg, Confederate cavalry under Col. William "Mudwall" Jackson delayed him and called on Gen. Echols near Lewisburg for support. At 2 A.M. on November 5th, Echols began a night march to Droop Mountain, an imposing position where Col. Jackson had posted his cavalry. This is the view from the mountaintop position of Echols' force. The artillery posted here dominated the whole area, and the terrain itself was enough of an obstacle. Averell could clearly see that this position was too strong to be taken directly. Averell committed only enough troops here to make a demonstration. At 2 P.M., Averell sent the majority of his force to the west on a nine mile flanking march. Although the Confederates detected the movement, the attack achieved surprise. The four regiments under Col. Augustus Moor attacked from the valley below up the slope to take the crude entrenchments near here. Echols sent reinforcements to his weakening left, and the Confederates reformed in a clearing just over the top of the mountain. Strength of numbers and the bravery of the men in the ranks won the day for the attacking Federals. Echols' force retreated beyond Lewisburg to another mountaintop position. Duffie had failed to cut off Echols' retreat at Lewisburg. With Echols' force intact, it was impossible to continue the raid to the New River bridge. Although Echols' had been defeated, he survived an attack by three times his numbers, which essentially ended the Union raid. Next month, Averell raided the Virginia & Tennessee at Salem, Virginia, but was lucky to make it back to West Virginia safely. The next raid on the bridge over the New River would climax at Cloyds Mountain in May 1864.
topo map The first photo was taken from the lookout tower shown on the map. The second photo was taken looking off the mountain just north of "Droop."